Levittown gets its name from its builder, the firm of Levitt & Sons, Inc. founded by Abraham Levitt on August 2, 1929, which built the district as a planned community between 1947 and 1951. Levittown was the first truly mass produced suburb and is widely regarded as the archetype for postwar suburbs throughout the country. 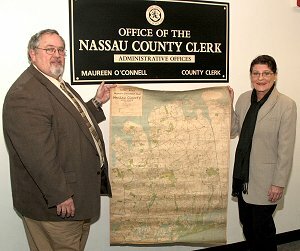 Clerk O’Connell was honored to be presented with this historical map.